Let’s take a look at the different settings and options in the Net Radar DSP remote mount radar detector to help you configure it for optimal performance, reduced false alerts, and customized to your preferences. For more information about the NR DSP, watch my Net Radar DSP review video. There’s two ways to configure your NR DSP, either through your computer and a USB stick that plugs into the ALP or using your phone if you have the optional bluetooth module. 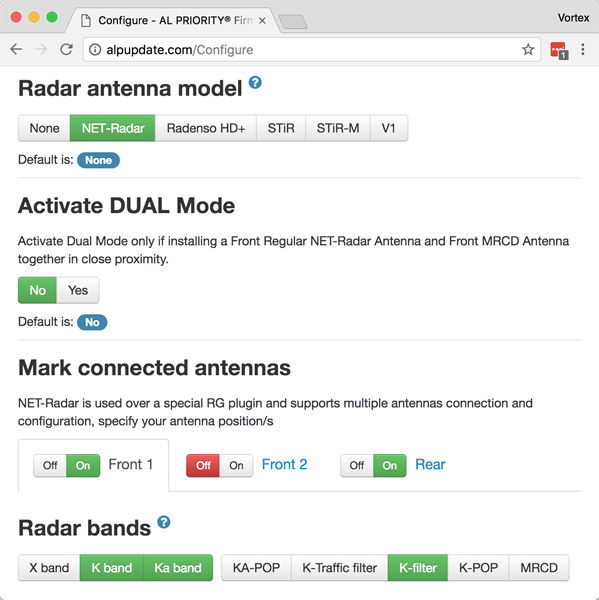 To configure the Net Radar DSP using your computer, you go to the ALP Configuration page, choose the settings you want, download the config file, copy it onto a USB drive, and plug the USB drive into your ALP. 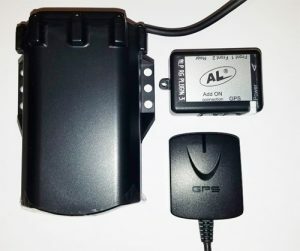 To configure the radar detector using your phone, as long as you have the Bluetooth module, use the ALPConnect app (Android or iOS), go into the app settings, and choose the NR DSP settings you want via the website. Then you download those settings back into the app and load them onto your ALP. Next to each setting you’ll see a blue ? and if you hover your mouse over it, you’ll get a basic explanation of each feature if you have any questions. Most of the settings are pretty self-explanatory, but I’ll cover things in a bit more detail here. This option is for users of the original Net Radar (not the DSP) where the standard and MRCD antennas were two separate units. With the DSP, normal radar and MRCD are in one integrated unit and you don’t need two separate antennas. Front 1: Turn this on to enable your front Net Radar DSP antenna. Front 2: This option is for users of the original Net Radar running a second front facing MRCD antenna. Rear: Enable if you have a rear antenna. Important note: Front and rear antennas are configured separately. You’ll need to go in and adjust both the front and rear antennas. For example, if you disable X band on the front antenna, the rear antenna will still have X band on (default option) unless you go in and disable that too. X Band: Disable across most of the US. X band is only still in active use in OH, NJ, and a few rural parts of the country. K Band: Keep enabled for K band detection which is in use in most all of the country. Can be disabled in CA. Ka Band: Keep enabled for Ka band detection which is in use all across the US. K-Traffic Filter: Equivalent of TSR/TMF to filter out K band traffic sensors along many highways. MRCD: MultaRadar CD detection, important for drivers in Alberta, Quebec, and certain areas of New York where the MRCD is in use. K band segmentation allows you to fine tune exactly which frequency ranges the NR DSP sweeps for on K band. This is primarily useful for drivers overseas where police radar is only used in small subsections of K band and so many false alerts can be filtered out. In the US, however, police use K band radar guns all over the range that the detector sweeps for so you’ll want to keep it set to K Wide. Ka Band segmentation allows you to fine tune exactly what frequency ranges the NR DSP sweeps for on Ka band, a much wider range of frequencies. With the original NR, the detector always sweeps all of Ka band and the segmentation options are just muting. With the NR DSP, Ka segmentation actually adjusts which frequencies the detector scans for which means you’ll have a performance boost if you disable unneeded segments. In the US, you can set the NR DSP to scan for 2/5/6/8 and you’ll be set. Learn which segments are needed across the US. Read this article about Ka Band segmentation for more information. Ka band at Full Strength: For the first 3 seconds, treat every Ka signal as a full strength alert, then alert normally. Disable if you want a weak signal to sound like a weak signal when you first detect it (recommended). Choose which radar filter threshold profile is the default setting. Highway is maximum sensitivity at all times. City yellow filters out X and K band signals when they’re still weak, only alerting you to stronger signals. City red is even more aggressive filtering, requiring signals to get stronger still before you get an alert. You can change filter profiles on the fly by double pressing the power button (left button) on the control pad or by tapping on the filter setting on your phone app. Adjust how strong a signal needs to get (on a scale from 1-10 where 1 is a weak signal and 10 is a full tilt strong signal) before your radar detector alerts. Alet at full volume for 6 seconds and then reduce the audio volume to a quieter level after the radar detector has your attention. Low speed muting. The radar detector will only alert when traveling above a set speed. Choose if low speed muting applies to X/K/Ka bands or only to X/K. Ka is almost always a high priority and legitimate alert so it’s good to know about that even when traveling at low speeds. If you’ve wired the stereo mute cable from the ALP into your stereo, you can choose if you want your radar detector to mute your car stereo when you get an alert. Purchase the Net Radar DSP (USA) here. I live in the San Francisco’s East Bay Area. Do you know of a reputable installer who could do a nice installation on my new BMW 6 series? Pairing this with the ALP seems to be the ideal combo if one is looking for a remote setup. The advantages are obvious, even in places where dash mounted radar detectors are legal, since one would avoid antagonizing anyone who has an issue with radar detectors on the dash. I’m really interested in filtering out false positives with a radar detector setup while also having my phone available to run waze. Is there any way to pair this with the ALP, have decent filtering out of the false positives, and have my phone free to run other apps? just installed Net Radar DSP Front and rear and noticed the supress function isnt working I will click supress and it just keeps right on alerting I use an Iphone any ideas ??? Thanks some others had the same problem removed the app on iphone reinstalled and did a reset of the configuration file. Its working now as expected just that pesky iphone APP for JTK is annoying might just have to get the FLICK or a dedicated Android Phone. With the new 2/11/19 firmware update ALPUPDATE recommends that NetRadar users check our K band segmentation. Do you have any recommended changes for those of us in North America? The big change is the ability to turn off segment K5 to turn off 24.195-24.205 and cut out most Honda/Acura falses.